Consumption of cardamom of any type helps you with cardiovascular problems too. According to reports published in different health magazines and journals, it is very effective for the lower heartbeat or controlled rhythm and helps to control hypertension too. Latest studies in the medical field by Indian researchers have proved that cardamom contains micronutrients and cardiac antioxidant enzymes which influence the cholesterol levels and further helps in controlling them. Cardamom also contains anti-depressant properties hence its oil is used during various therapies. It also helps to cure mental illness and depression. Enjoying a cup of cardamom tea is a perfect way to fight depression. Cardamom is a great remedy for urinary tract diseases and infections such as cystitis, gonorrhea, and nephritis. Cardamom is best to prevent cancer, particularly colorectal cancer. Cancer therapies are costly and do not give fruitful results hence it is always advised to build a healthy immune system and consumption of cardamom helps you with this. Research has shown that dietary cardamom is effective in cases of colorectal cancer to an extent of 48%. In Ayurveda, traditional Chinese medicine and the Unani system the consumption of Cardamom is suggested as a perfect remedy for gastrointestinal disorders. It contains a methanolic extract that helps in curing gastrointestinal problems like acidity, stomach cramps and flatulence. Successful experiments conducted on the volatile extracts of cardamom proved that the oils from cardamom are able to control the growth and spread of some of the very dangerous microbes that regularly cause food poisoning. Muscle spasms are painful and usually happen in old age. Sudden contraction of the muscle is the main cause behind it. Consuming cardamom is very helpful as a controlling measure for muscle spasms. Cardamom is one of the important ingredients of oral and dental products prepared traditionally as mentioned in Ayurveda as well as traditional Chinese medicine books for dealing with dental problems. According to Ayurveda, it can also be used as a remedy for asthma and other respiratory issues. It has been scientifically proven by the latest studies that the extracts from cardamom were effective in causing relaxation to the tracheal tissues. It is found that this spice possesses anti-inflammatory and anti-carcinogenic properties. Hence elaichi is very helpful to provide relief from muscle and joint pain. Elaichi is best known as a detoxifying agent. It contains essential oils and biochemicals which provide detoxifying effects. Detoxification is very necessary for the human body as the daily production of toxins can cause serious medical issues if not excreted. This spice is rich in minerals and vitamins like Vitamin A, B, C, niacin, riboflavin etc. It is an amazing blood purifying agent and also works to remove excess urea, calcium and other toxins from the kidney. 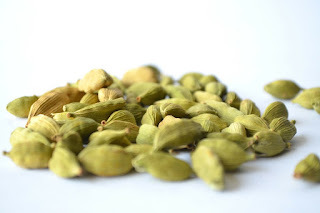 Cardamom pods and seeds are natural breath freshener when chewed after the meal. The flavors and aroma found in th is spice make it a suitable ingredient for mouth fresheners and chewing gums. It is also used for mouth ulcers and mouth infections. Cold, cough or respiratory congestion is very common nowadays. There is no perfect allopathic medicine available for the cure. But using elaichi in hot beverages or simply inhaling the vapors of boiling water by adding some cardamom oil will help you. For ages cardamom tea has been used as a home remedy to treat cold and flu. Green cardamom is very helpful with the patients of low and high Blood Pressure as it is a rich source of potassium, magnesium, and calcium. Potassium is essential for keeping the heart rate normal and to maintain a normal rate of blood circulation. It also helps with a healthy heart rate. If you are having certain problems like light headedness, exhaustion, dizziness, and depression then the Ayurvedic doctor will advise you to consume green cardamom as its aroma helps to give instant relief. Green cardamom is very effective in anemia treatment. The reason is cardamom contains copper, iron Vitamin C, riboflavin, niacin and other important vitamins. These nutrients help with RBC’s generation and blood metabolism. Cardamom is known to be an antispasmodic spice which works amazingly to get rid of hiccups. Consuming It provides instant relief from involuntary muscle spasms, like intestinal and stomach cramps. The nutrients present in cardamom like the many phytonutrients, vitamins and essential oils act as antioxidants. Cardamom works in fighting with the free radicals and helps to also keep away the signs of aging. Cardamom is known to have amazing powers to prevent infections due to its therapeutic properties. The various essential oils present in this spice stop the growth of bacteria, viruses, mold and fungus. Including ground cardamom or pods in your daily diet or just chewing some of its seeds work amazingly to improve your appetite.